As winter approaches, it is a good idea to prepare your garden for the harsh weather ahead, to ensure it is healthy and vigorous in the early spring. Low temperatures are hard on sensitive soil organisms, and adding certain nutrients, amendments, and protection now can give those populations the food and shelter they need to survive the winter. This will also give you just a little bit of a head start next season. This article is geared primarily towards vegetable and herb gardens, but many of the steps remain the same for any type of garden. Despite the harsh winter temperatures in our region, many vegetable crops can be successfully harvested into the winter, or overwintered with the right protection. These include carrots, parsnips, turnips, potatoes, spinach, Asian greens, lettuce, and radishes. 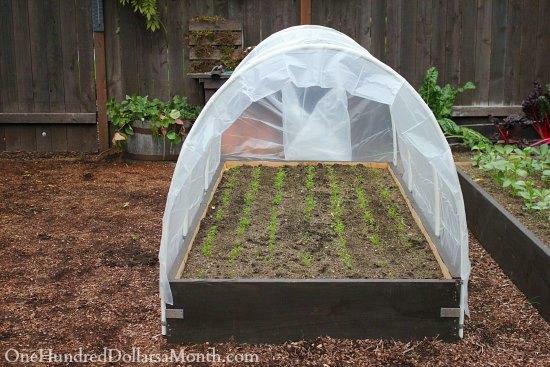 If you have some of these crops in your garden and wish to harvest them after frost, use a floating row cover, and/or a low tunnel (plastic) for leafy greens. For root crops, add a heavy layer of leaf mulch. Some herbs are tougher than others when it comes to overwintering and flourishing again in the spring. Sage, chives, and thyme are good examples. Typically, they do not require any extra protection and are perennials that will lie dormant for the winter. You can transplant a clump of chives into a small pot and keep them indoors for harvesting all winter. More sensitive herbs, however, such as rosemary and parsley, require extra protection in anything colder than a zone 5. Cover parsley with row cover or heavy mulch. Rosemary, a tender evergreen perennial, should be potted so you can bring it indoors during the winter. In many cases, it is fine and beneficial to leave plant debris where it is for the winter; gardens do not, and should not, need to be completely free of spent plant matter, unless it has the potential for disease. Tomatoes, beans, and squash, are good examples. Not only are these plants prone to harbour disease that can overwinter in your garden, their stalks are fibrous and unlikely to decompose in your garden anyway. It is best to remove these plants and compost them if they are free of disease or burn them otherwise. Other, generally safe plant matter, such as lettuces, spinach, and beet greens can be left in your garden bed. If you are going to do this, lightly work any plant debris into the soil surface to expose any harbouring pests and to increase contact with soil microbes. In addition, it is wise to also clean accompanying garden pieces such as tomato cages or supports with a 2:1 solution of water and bleach. Be sure to remove any weeds. If your garden bed is particularly weedy, you can smother the bed with black plastic to weaken overwintering, and kill any emerging weed seedlings in the early spring. Even the smallest of gardening spaces can be cover cropped with a green manure, and there are many to choose from. If your season is approaching cold temperatures, fall or winter rye is your best option, as this seed can germinate even after a frost. Fall rye is a soil builder. This cereal grain grows quickly in the fall and survives winter weather even in zone 3 (Williams Lake is a zone 4b). It bursts into growth in the spring, so try to turn under or cut back before it reaches 30 cm (12 inches). It is harder to turn under when it is 1 m (3 feet) tall. Extensive roots loosen topsoil and improve drainage. Plant in mid-September for best results, but fall rye will germinate as late as mid-October. One cannot stress enough the utility of mulching. As noted earlier, winter temperatures are hard on soil micro and macro-organisms, but mulching can greatly reduce this pressure by providing habitat and a protective layer from frost, as well as a source of organic matter in the spring. It will also allow you to work the soil earlier in spring, retaining more heat and moisture than bare soil, and suppressing emerging weed growth. Simply put, mulching soil is preparing it for winter just as nature would, providing nutrients and shelter. This is arguably your most important fall-prep task in the garden. Leaf litter is your best option, as it is a free and abundant resource in the fall, breaks down quickly, adds a medium-rich carbon source to your soil, and is a favourite among many soil-dwelling organisms such as worms. It can be worked in during the spring if it is sufficiently decomposed (ie: a light, crumbly texture), but allow 2-3 weeks before planting seeds or transplants. If it isn’t broken down, simply remove it and add it to your compost bin. Straw is also another great mulch that may be readily available to you, but it is not recommended you work this into the soil. It has a higher carbon to nitrogen ratio than leaves and will rob the soil of a higher amount of nitrogen to break down. Simply remove it and use it to compost in the spring. Otherwise, straw does break down very quickly and will provide an ideal habitat for beneficial organisms in your soil over the winter. A cover crop, as described above, will also act as a great mulch. granular fertilizers now, such as meals, (alfalfa, bone, blood, fish, etc.) or kelp, will allow it time to break down and become more available to plants in the early spring, as this is a very slow process over the winter. If you have a finished compost pile, it is better to wait until spring to work this in, as microbes will be slightly more protected in a warm compost pile than they are spread out in a garden bed, especially if the pile is at least 1 cubic metre or bigger, and insulated with leaves, straw, or other dense material (such as snow!). If you are buying compost, however, work this in now, and mulch. Your soil will be that much further ahead in the spring, for planting. Brianna van de Wijngaard is the assistant food action co-ordinator for the Williams Lake Food Policy Council, a certified organic master gardener, and owner/operator of Puddle Produce Urban Farms. If you are interested in becoming more involved with the WL Food Policy Council, or in signing up for a community garden bed, contact us at foodpolicycouncil@hotmail.com.